Vanna K is a huge lover of rubies. The gemstone has a long and storied history. In ancient times, they were most commonly associated with wealth and royalty. However, they were also considered by many to have special powers, due to the way light would glow from within - many believing they were holding spiritual properties. They were often searched out to be worn for their believed healing and protective properties. Also known as a "stone of soldiers", many believed the stone would protect them in battle, keeping them invulnerable from wounds by spears, swords or guns. Burmese soldiers would actually insert the rubies into their flesh so that they would become one with their bodies, an ultimate protector of body, souls and hearts. Today we simply know these beautiful stones for their alluring good looks. Rubies (from the Latin word "ruber", meaning "red") stand out as gemstones with their rich, red colors. Red in itself is known as the most passionate color, representing strong emotions such as anger, and most notably love. Today's most famous rubies are found in marble, a metamorphic rock. These rubies have a rich red color and usually glow a bright red underneath sunlight. This glow make the red color appear even stronger. Darker rubies are found within igneous rocks. 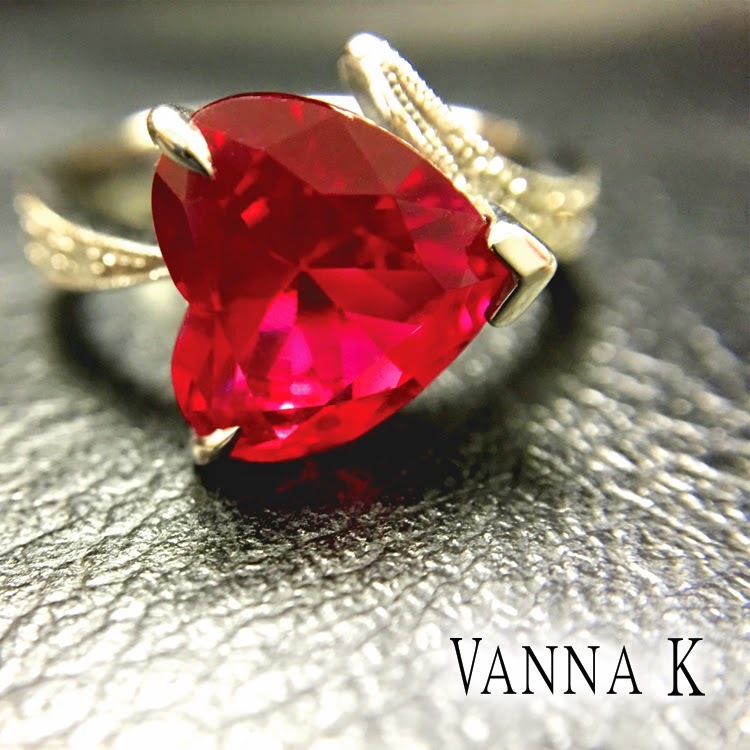 The Vanna K ring shown here features one of those special rubies. This 4 carat natural Burmese Ruby is poetically crafted into a special heart shape. Accented with .25 carat in diamonds, this ring is stunningly beautiful. If you know someone who loves love, someone who wants to feel both passion and protection, all while looking uniquely amazing, this ring is for them. More than fashion, it will represent to them that they have your heart and even more importantly - that you are protecting theirs.